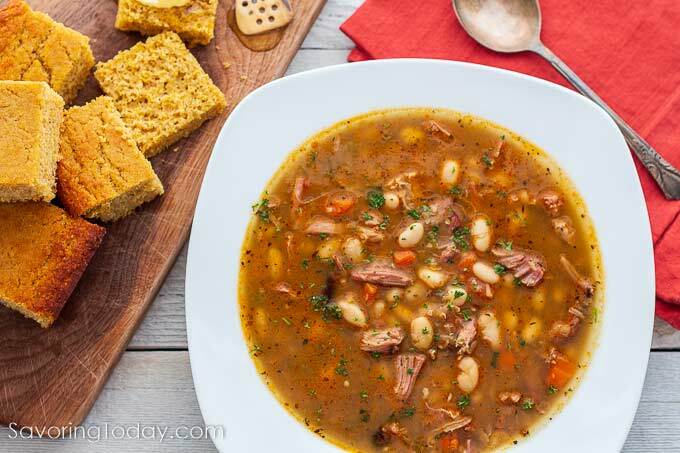 A big pot of white bean soup with smoked turkey or ham is a favorite because if its simplicity and delicious use of leftovers. 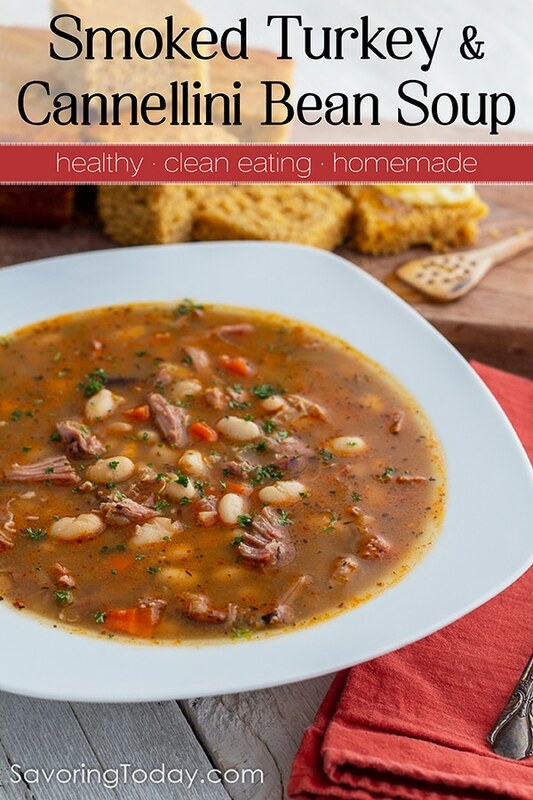 Smoked Turkey & Bean Soup Recipe rivals traditional ham soup, but leftover ham bone or ham hocks can be substituted. Updated with Pressure Cooker instructions! See recipe notes for more details. Beans are a great source of fiber, protein, vitamins, and minerals—one meal that can help you keep those New Year’s resolutions to take better care of yourself. Navy, Great Northern, pinto, black-eyed peas, or the 15 bean concoction are all good choices for this recipe. 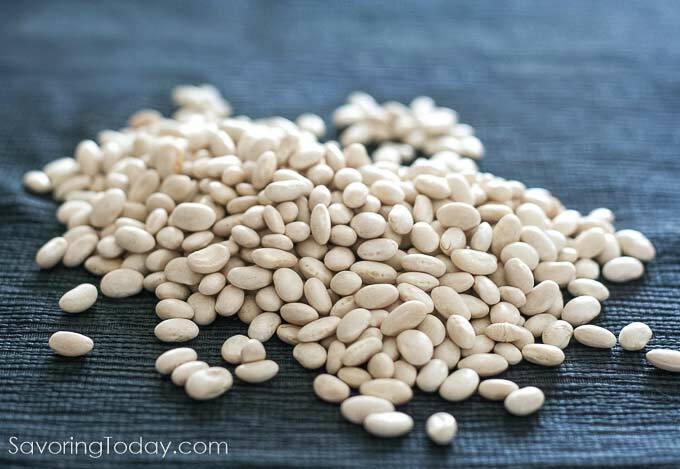 Our favorite is cannellini, which are a white kidney bean with a soft, creamy texture. Yes, you can smoke your own turkey, but you don’t have to. To smoke your own turkey, take a look at Charbroil’s instructions for electric smokers or Traeger’s instructions on their wood smoker. If you don’t have a smoker to make your own smoked turkey, Diestel Smoked Turkey Drums & Thighs make it easy to get the sweet, smoky flavor bean soup demands. Here in Colorado, this premium turkey brand is found at Whole Foods. We prefer Diestel brand because of their sustainable farming methods and natural, hardwood smoking process. The flavor is pleasantly smoky and lightly seasoned, giving me more control over the amount of salt. Each thigh or drumstick is individually wrapped so it’s easy to customize the amount or combination you want. In this case, two smoked turkey thighs provide plenty of meat for 5 quarts of hearty soup. Stove top, slow cooker or pressure cooker instructions included. I’ve prepared this soup in a slow cooker and in my stockpot, but I’m using my pressure cooker to make soups faster (see notes in recipe). The beans cook beautifully in the pressure cooker, however, the meat doesn’t quite get to the fall-off-the-bone stage in such a short time, but the flavor is the same. TIP: Use organic canned beans if you’re in a pinch for time, reducing cooking time as well. However, we think you’ll prefer the taste and creamy texture of dried beans. 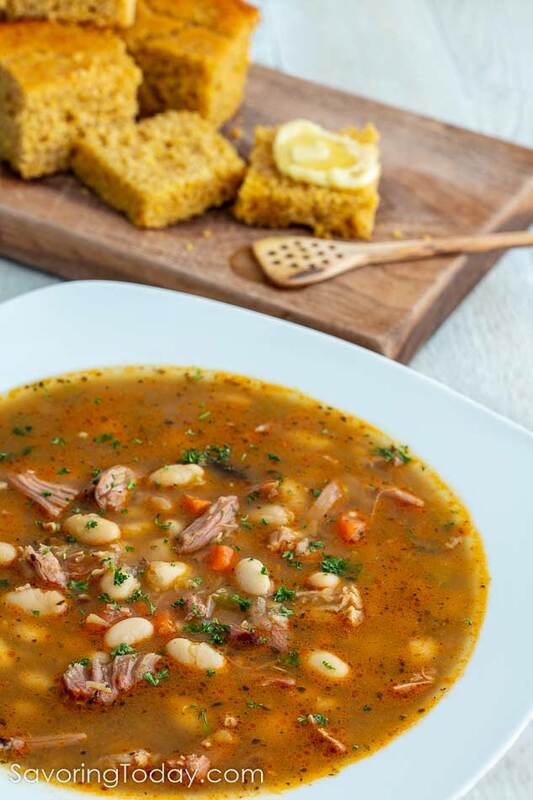 A twist on traditional ham and navy bean soup using Diestel Smoked Turkey Thighs and cannellini (white kidney) beans. Dissolve 1 teaspoon baking soda in 4 quarts water in a large pot. Add beans and soak at room temperature for at least 8 hours. Drain and rinse well. Stir in soaked and rinsed beans, lentils, turkey thighs or drumsticks, and bay leaf to the pot; cover with broth or stock. Be sure to add enough liquid to cover with 2-3 inches above ingredients to allow beans to absorb liquid. The exact amount of broth will depend on the amount of meat added. Additional water may be needed. *See Note for pressure cooker method. Bring to a boil then reduce heat and simmer for 2-3 hours on the stove or 4-6 hours in a crockpot set on low. Add spices and bouillon the last hour or so, adjust until desired flavor is reached. Salt and pepper to taste. Before serving, remove bones and large pieces of turkey from the pot; allow to cool slightly on a platter. Once cool enough to handle, separate meat from the bones and any unappealing connective tissue. Return meat to the pot and discard bones. 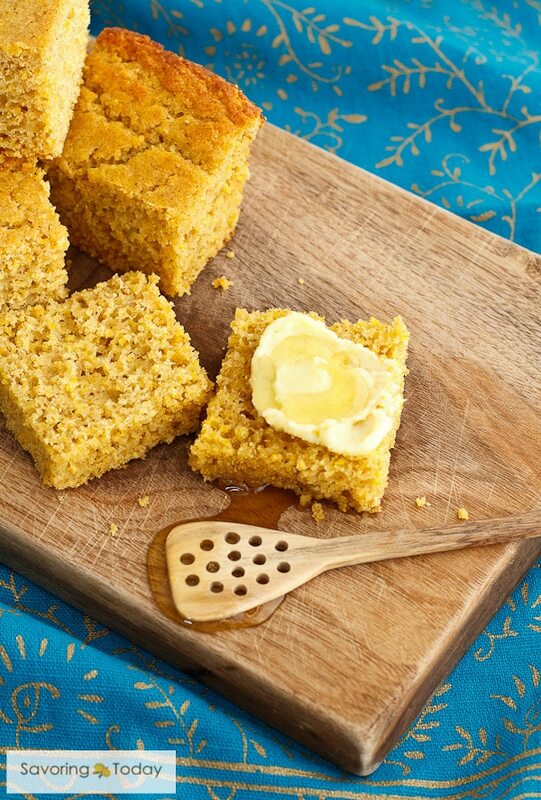 Serve with cornbread and honey-butter. Once the onion, celery, carrot and garlic are softened, add all the ingredients to the pot, including spices. Bring soup to pressure based on manufacturer's instructions. Reduce heat enough to keep at pressure for 15 minutes. Beans should be soft and ready for salt and pepper, to taste. Before serving, remove bones and large pieces of turkey from the pot; allow to cool slightly on a platter. Once cool enough to handle, separate meat from the bones and any unappealing connective tissue. Return meat to the pot and discard bones. 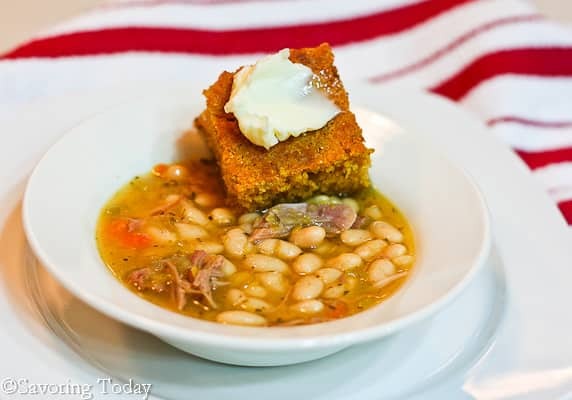 Smoky bean soup and sweet cornbread go together like movies and popcorn. 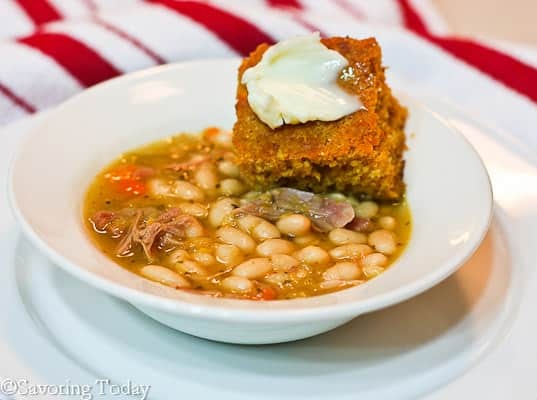 I cannot imagine bean soup without whole grain cornbread. Start with one piece in your bowl to soak up the broth and crown another one with butter and honey (this also qualifies as dessert). What a gorgeous soup! It’s so perfect for the winter. Looks so delicious and hearty! Perfect comfort food! We are expecting snow again! I could use a bowl of this to warm me up. This is the ultimate comfort food! 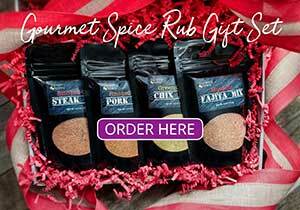 I love all the flavors and spices you’ve put together in this recipe! Wow, just so yummy! I Love this soup! After cooking beans in the pressure cooker, I’m hooked. This combo with pressure cooker beans and turkey, yum! Looks delicious and reminds me of the super hearty soups I ate in Italy. Can’t wait to give it a try! What a good idea for a great lunch for the kids! What a great winter soup! I’m ready to dive into a big bowl! This is perfect comfort food. And that cornbread! Perfect combo. Omg this cornbread! I love soups with cannellini beans, so hearty and filling! This is a great recipe for my comfort board. I will share this as it was delicious. I’m making this for a group of 12 ladies. I think I’ll add a can of diced tomatoes and some chicken andouille sausage in place of the Meat Magic spice. I have a ton of smoked turkey leftover from Christmas, so this is perfect. I have red lentils to use, and they usually cook down a lot more than brown ones, especially in the Instant Pot. Thanks for this – can’t wait to serve it! Hi Cheryl, I hope all goes well with the ladies and they enjoy your efforts! Please do let me know! How does the turkey looks like after smoking, I like this BEAN SOUP very much. I buy it already smoked and it is a caramel brown color. Glad you like the soup! Thanks. I love to use smoked turkey in soups, Judy. It add so much flavor to the pot, closely resembling the pork products I once used. It would work perfectly in your bean soup and I know this was one tasty bowl of comfort! The colors are so beautiful! It just got cold again here in NYC and this looks like an amazing recipe to help get through until spring weather returns! What a nice soup recipe, definitely will keep as winter is coming fast our way. I may only have hard time looking for smoked turkey so I will be using chicken instead. This is a wonderful recipe for our dinner this evening but will have to replace the turkey with chicken. Lovely. I haven’t yet gotten a pressure cooker, but keep thinking I should. One of these days! I love soups like this — so many great flavors going on. Thanks. Thank you for a great looking recipe. I can use this. Glad to see the Chef Paul Prudhomme’s Meat Magic. We use his Vegetable Magic like it’s going out of style. You said it all with that first sentence! I can just look at that beautiful picture of yours and just taste to goodness in this soup. Perfect meal for the cold front we’ll be getting next week! This soup turned out fantastic! I made the stock with the turkey legs while the beans were soaking, substituted some blackening seasoning I had on hand for Prudhomme’s Meat Magic, and left out the beef bouillon because I did not have any. Then added a couple of cups of smoked turkey and the seasonings during the last half hour of cooking. It made a bunch so I will happily have some to freeze for later! 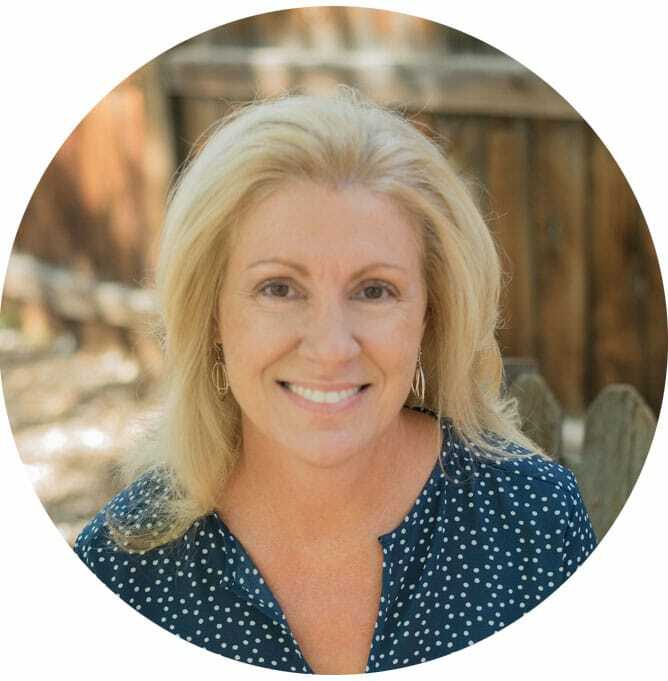 Hi Debbie, thank you so much for taking the time to let me know how much you liked the soup–feedback is so helpful to edit and improve recipes! Substitutions are the beauty of making soup, so easy to customize, and you can’t go wrong with homemade stock. 🙂 Glad you enjoyed this recipe and that you have some for later too! I used smoked Spanish paprika instead of meat magic. This looks delicious! I can imagine that this would work really well with ham, too. Thanks for sharing with Sunday Night Soup Night, look forward to seeing you again soon! Looks delicious. Love the smoked turkey for ham substitution. I love fall soups, this sounds like a perfect fit for a beautiful crisp day! Thanks for linking up with Friday Food on MomTrends.com! Any idea on the calorie count for this soup, recipe is spot on delicious! Hi Tom, so glad you liked the soup — it is one of my all-time faves. 🙂 As to the calorie count, I put it through a couple online resources and the calorie count is somewhere between 160-175 per 1 1/2 cup serving. It can be is hard to get precise because most of the online tools can only evaluate specific ingredients it recognizes, the checking it on two sources this should be close. 🙂 Hope that helps!